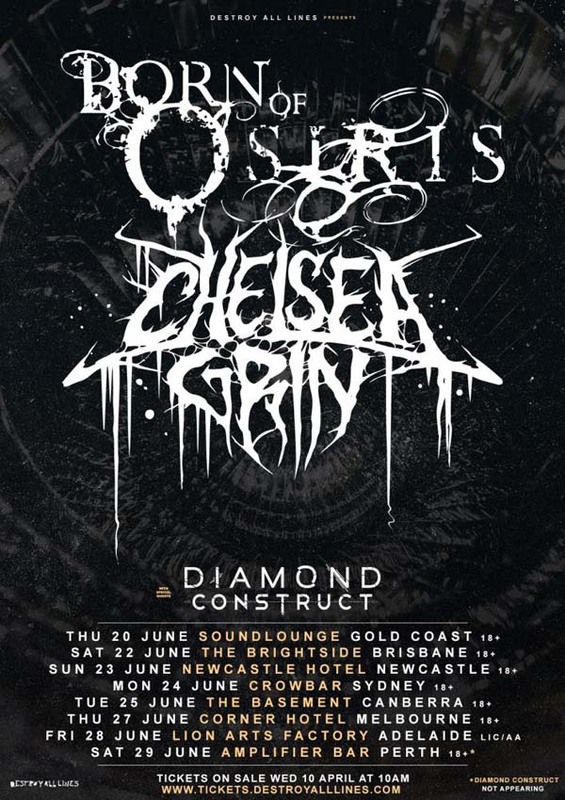 Prepare yourselves as two of the finest international heavy exports, Born Of Osiris & Chelsea Grin, team up for a huge national co-headline Australian tour joined by homegrown talent Diamond Construct this June. Born Of Osiris' latest album The Simulation debates the idea of Simulation Theory - which posits that reality and existence as we know them to be are merely a computer simulation. Of course, The Matrix explored such a possibility in 1999, while Elon Musk espouses this hypothesis as gospel for 2019. Born Of Osiris preserve such humanity within a torrent of destructive poly-rhythmic riffing, chaotic vocal transmissions, and synth disarray. Not only have the band performed on stages with Judas Priest, Rob Zombie, Bring Me The Horizon, and more, but they also landed four consecutive entries on the Billboard Top 200. Chelsea Grin, from Salt Lake City, Utah are currently signed to Rise Records and have released two EPs (Chelsea Grin in July 2008, and Evolve in June 2012) and five full-length albums! The band named themselves after the infamous torture manoeuvre known as the Glasgow smile or "Chelsea grin". Chelsea Grin keeps the listener engaged in a unique onslaught of technical and aggressive riffage. Chelsea Grin have been featured on a large number of European and American music festivals which include Vans Warped Tour, Download Festival, With Full Force and many more. Diamond Construct have spent the last six months touring around Australia alongside Alpha Wolf and Justice For The Damned in December & Thornhill in April, growing as performers, and putting their sounds into new ears and making new fans. As the year continues, the heavy outfit from Taree are hungry to get back on the road again, as they are gearing up to release their debut album in May and show the world what Diamond Construct are all about. This is a must see tour for all heavy fans. Mark 10am this Wednesday 10th April into your calendar as tickets go on sale from Destroy All Lines.